Hibernate Tips is a series of posts in which I describe a quick and easy solution for common Hibernate questions. If you have a question for a future Hibernate Tip, please post a comment below. 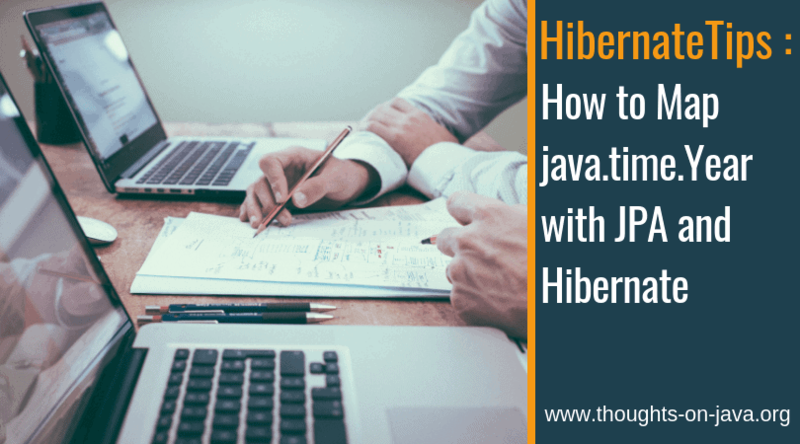 How can I map a java.time.Year attribute with Hibernate? JPA 2.2 and Hibernate support several classes of the Date and Time API. Unfortunately, the java.time.Year class isn’t one of them. If you want to use it as an attribute type, you need to provide a custom mapping for it. But don’t worry, you can do that easily with an AttributeConverter, and it only requires a few lines of code. An AttributeConverter provides a portable way to create custom type mappings. The only thing you need to do is to implement the AttributeConverter interface and annotate your class with the @Converter annotation. Here you can see an example of an AttributeConverter that maps a java.time.Year object to a Short. As you can see, the implementation of a converter is very simple. The interface only defines a method to convert the entity attribute to its database representation and another one for the inverse operation. In this example, the implementation of these 2 methods is pretty simple because the Year class already provides methods to get the Integer value of a give Year object and to create a Year object from an Integer. You can then either persist the Integer or you can try to save some space and cast it to a Short. When you annotate your AttributeConverter with the @Converter annotation, you should ask yourself if you want to use it for all attributes of the converted type. If you want to do that, you should set the autoApply attribute to true. Hibernate will then use the converter automatically, and you don’t need to use any additional mapping annotation. In this case, the decision is easy. Hibernate doesn’t support java.time.Year as a type and you should use it for all entity attributes of that type. After you implemented the YearConverter and added it to your project, you can use java.time.Year as an attribute type. And because you set the autoApply attribute to true, you can do that without any additional mapping annotations.